With most of the game’s top-spending teams apparently determined to remain on the sidelines instead of wooing either Bryce Harper or Manny Machado, the White Sox have been conspicuous in their reported pursuit of both. That’s a surprise, given both the team’s recent lack of success and their historical avoidance of big contracts, but late last month, general manager Rick Hahn acknowledged that fans would likely be disappointed if they didn’t land one of the winter’s big fish. Given that the White Sox haven’t finished above .500 since 2012, and that last year, their second year of a long-term rebuilding program, they lost 100 games — their highest total since 1970 — it might seem like an odd time to spend big money. Then again, at a time when so many teams appear to have lost their checkbooks, if Chicago’s desire to spend is sincere, they may be tapping into a market inefficiency. Considering their history under owner Jerry Reinsdorf, however, it’s fair to be skeptical until the ink is dry on a contract for either Harper or Machado. Revised from a 2015 MLB Trade Rumors list. All dollar figures in millions. Signing dates via MLB Trade Rumors, Cot’s Contracts, or Baseball-Reference. FA = free agent, Ext = extension. The Indians, A’s, Royals, and Pirates are all generally considered to be smaller market teams, though the A’s are actually in one of the larger media markets (via Nielsen TV market sizes, San Francisco/Oakland/San Jose ranks eighth, just ahead of Boston and Atlanta). The White Sox, who play in the majors’ third-largest market, are the exception. Under Reinsdorf, the longest-tenured major league owner and the lone owner remaining from the late 1980s collusion scandal (the fathers of Yankees managing general partner Hal Steinbrenner and Twins owner Jim Pohlad were part of that sorry saga as well), the White Sox have rarely spent like a large-market team. According to Cot’s Contracts, they haven’t had a year-end payroll (based on their 40-man roster) that ranked higher than seventh since 2000, and haven’t ranked in the upper half of the majors since 2013, when they were 12th. 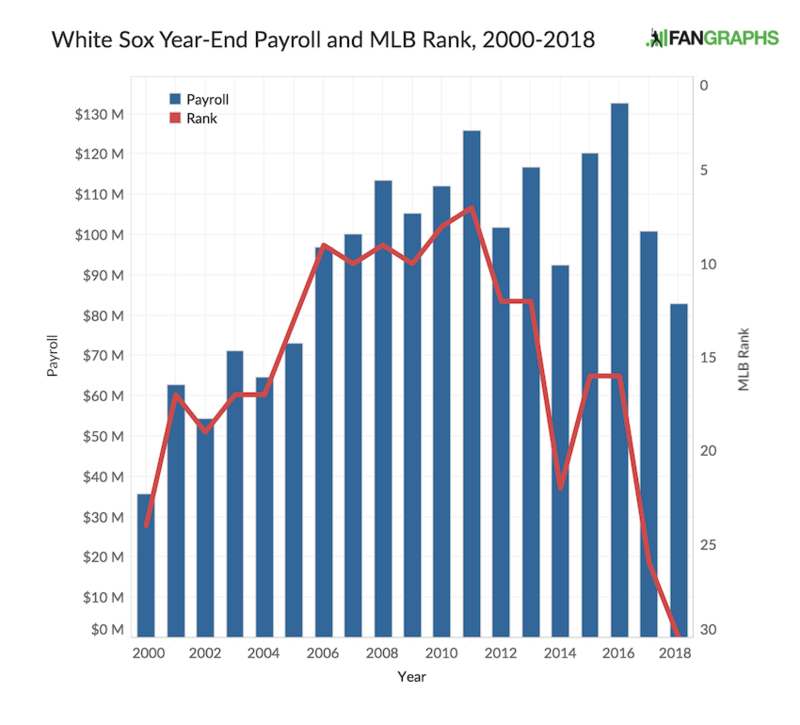 Last year, the White Sox had the majors’ second-lowest Opening Day payroll ($71.2 million) and finished the with the lowest year-end payroll ($82.9 million). In 2017 — after a winter in which they traded away Chris Sale and Adam Eaton — they dealt away Melky Cabrera, Todd Frazier, Jose Quintana, and David Robertson midseason; after leaving the gate at 23rd ($97.8 million), they finished at 26th ($100.9 million). It’s been anathema to Reinsdorf to spend big money lately, but it wasn’t always that way. Though he was at the center of the collusion conspiracy in the mid-1980s — arbitrator George Nicolau detailed his efforts (along with those of Bud Selig) to exhort the Phillies not to sign free agent catcher Lance Parrish — and was the most hawkish of owners leading up to the 1994 strike, where the owners demanded a salary cap, he ran top-five payrolls from 1995-97, the first three seasons after the strike. Frank Thomas was the game’s fifth-highest paid player in the first two of those years, with annual salaries of $7.15 million resulting from a four-year, $29-million 1993 extension that ranked second only to Barry Bonds‘ $7.29 million in average annual value. Reinsdorf flexed economic muscles that few baseball teams can, despite his call for fiscal restraint on salaries and his successful challenge of a proposed agreement with the players’ union that would have placed a luxury tax on the teams with the highest payrolls. The big spending did not last long. The White Sox placed third in the AL Central in 1995, and second in each of the next three seasons despite finishing with records just below .500. After beginning the 1997 season with the game’s third-highest payroll ($54.3 million), Reinsdorf ordered general manager Ron Schueler to clean house with the infamous “white flag” trade of Wilson Alvarez ($4,662,500), Roberto Hernandez ($4,620,000) and Danny Darwin ($475,000) to the Giants for prospects, at a time when the White Sox were 52-53, 3.5 games out of first; two days earlier, they had dealt away Harold Baines ($1,925,000). The next year, they opened with the game’s 18th-ranked payroll. By 1998, Mo Vaughn, Randy Johnson, and Mike Piazza had all surpassed Belle in average salary. When the White Sox wouldn’t rework the slugger’s deal to remain in compliance with the top-three guarantee, he became a free agent and signed a five-year, $65 million contract with the Orioles, equaling Piazza’s $13 million AAV. That deal didn’t turn out so hot because of a degenerative hip condition that forced him to retire after the 2000 season, when he was just 34. Technically, the White Sox exceeded Belle’s $55 million contract when Thomas signed an extension after the 1997 season, but the deal did not actually guarantee $85 million over six years, which is how it was reported at the time. The first two years of the contract merely guaranteed the club options ($7.15 million for 1999 and $7.25 million for 2000) at the end of his previous four-year contract, while its last two were club options for 2005 and ’06, worth $10.3 million apiece. By the now-standard conventions of counting only guaranteed money (à la Cot’s Contracts), the extension is scored as a seven-year, $64.4 million deal. It too had some bell(e)s and whistles that prevented it from running to its conclusion. After Thomas was limited to just 20 games in 2001 by surgery to repair torn triceps and then slipped to an uncharacteristic .252/.361/.472 (119 wRC+) line in 2002, the White Sox invoked a “diminished skills” clause — predicated on his making the All-Star team, winning a Silver Slugger award, or ranking in the top 10 of the MVP vote — that allowed them to defer $10.124 million per year of his future salaries. Thomas, understandably disgruntled, was allowed to file for free agency in response, though he returned to the fold on a separate one-year, $5 million deal that added three options, each of which was valued differently depending upon whether the player or the club exercised it. Thus, it wasn’t until the Sox signed pitcher John Danks to a five-year, $65 million extension in December 2011 that they actually exceeded Thomas’ extension in terms of guaranteed money. Danks missed most of the 2012 season due to surgery to repair tears in his anterior capsule and rotator cuff, and ended up giving the team a 4.92 ERA and just 2.5 WAR over those five seasons before drawing his release in May 2016; he never pitched in the majors again. By the time he departed, his contract had been superseded by the aforementioned six-year, $68 million deal for Abreu. So far, the contract has paid off with the 2014 AL Rookie of the Year award, a pair of All-Star appearances, and a total of 15.9 WAR. In the period between the Thomas and Abreu deals, the White Sox also made two other sizable signings. In mid-2007, they extended Mark Buehrle at four years and $56 million, his final pact with the team, and in December 2010, they signed Adam Dunn to a four-year, $56 million deal that went south quickly; in 2011, Dunn hit .159/.292/.277 with 11 homers and -2.9 WAR (! ), and while he recovered to make the AL All-Star team in 2012, he totaled just 2.8 WAR form 2012-14 before being dealt to the A’s. That’s not a great history, though virtually every team that’s played in the deep end of the pool has been burned by a pricey extension as well as an expensive free agent. Nonetheless, it does suggest how radical a break it would be for the White Sox to sign either Harper or Machado, as either contract would be the largest in team history by some nine-figure margin. Given the complexity of the top-end deals of Belle and Thomas, one has to wonder if the seven-year, $175 million offer to Machado that was reported by both ESPN’s Buster Olney and USA Today’s Bob Nightengale on January 16 — one that agent Dan Lozano shot down with a written statement calling the report “inaccurate and reckless… completely wrong” — reflected the guaranteed core of a deal containing options and other wingdings that would push its total well above $200 million — if not all the way to $300 million — while also giving the team greater protection than they might otherwise have in such a long-term deal. Again, that’s just my speculation, though I think we can all agree that $175 million, at $25 million per year, won’t get the job done for either superstar, even in this apparently depressed market — not with the Padres entering the fray and the Phillies still lurking. Much has been made of the White Sox trading for Machado’s brother-in-law, Yonder Alonso, and then signing one of his close friends, Jon Jay. Neither constitutes a big investment; Alonso is due $8 million this year, with a $9 million option and $1 million buyout for next year, while Jay will make $4 million. The team is currently projected for just 70 wins, with 25-year-old shortstop Tim Anderson and 26-year-old third baseman Yolmer Sanchez, the two players most likely to be affected by a Machado signing, projected for just 1.4 and 1.3 WAR, respectively. Anderson improved from 0.1 in 2017 to 2.0 last year, albeit with just a .281 on-base percentage, a 5.0% walk rate, and an 85 wRC+, while Sanchez had an 87 wRC+ with 1.7 WAR. As far as Harper is concerned, elite prospect Eloy Jimenez is projected for right field, while Daniel Palka, who hit 27 homers but with just a .294 on-base percentage and 0.7 WAR as a rookie, is slated for left. Jimenez aside, none of those players should stand in the way of a major signing. Ultimately, given the surprisingly minimal number of suitors and the apparently earnest interest of the White Sox, they may well land a big fish. But until they do, the onus is on them to show us the money. We hoped you liked reading Harper or Machado Megadeal Would Be out of Character for Chisox by Jay Jaffe! Paying ~$50M in bonus and fees for Luis Robert is worth mentioning. Not the same as a $250M contract, but the only recent time the the White Sox have spent with the big clubs. I’d also argue that it’s worth mentioning Robertson’s 4yr/$46M deal. That came before it was “cool” to sign relievers to big contracts, and it made him the second highest paid reliever in all of baseball in 2015 behind only Papelbon. Again, not the same thing as a $250M contract, but worth mentioning nonetheless.